Check out what's been happening at ATD WV in the Spring 2019 issue of our newsletter. Terry Cyfers, Assistant Director of the University of Charleston's Innovation Center, delivers an overview of Edward de Bono's Six Thinking Hats. CHARLESTON, WV – On Friday, March 15th, Charleston-area professionals tackled West Virginia’s education issues during a workshop hosted by the Association for Talent Development, or ATD, at the University of Charleston’s Innovation Center. 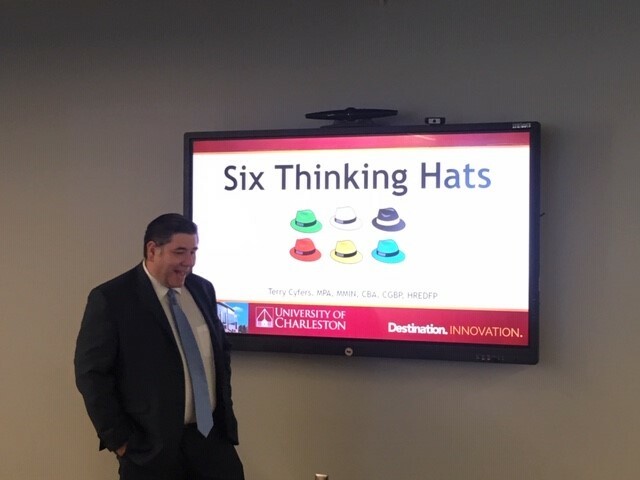 Terry Cyfers, Assistant Director of the University of Charleston’s Innovation Center, led a presentation and discussion about Edward de Bono’s Six Thinking Hats, a popular tool for enhancing collaboration and understanding within a team. The workshop challenged attendees to apply the Six Thinking Hats to a real problem in West Virginia – our struggling public schools. After presenting a lecture about the Six Thinking Hats, Cyfers announced the scenario attendees would be tasked with solving. Audience members noticeably reacted as they absorbed the details of the scenario: a failing school in a rural county experiencing chronic academic performance problems, poor infrastructure, a shortage of certified teachers, budget cuts, the bottom 5% of the salary range for WV teachers, and other issues. The audience’s strong reaction was due in part to their recognition of a reality for many WV parents: a child is failing at least one class, a high school senior is failing a class needed to graduate, or a student’s sports activities are being suspended until grades improve. According to metronews.com, the WV Board of Education found that 88% of WV high schools fall within the “does not meet standard” category for students’ math grades, while 21% of high schools are below the “meets standard” category for grades in English and language arts. The Board of Education also found that half of high schools are failing to meet the standard for attendance. Working in small groups, workshop participants used the Six Thinking Hats to guide and structure their discussion to come up with potential solutions to the scenario. Proposed solutions ranged from improving infrastructure, instituting a greater reliance on online education to lighten the load on teachers, and implementing charter and private schools. The topic was especially controversial given recent developments at the end of the 2019 West Virginia legislative session, which postponed indefinitely a controversial education bill that prompted statewide teacher strikes. Despite the controversy, participants expressed that the Six Thinking Hats helped keep the discussion respectful and productive. Kiel heard about the workshop from Mr. Cyfers, and wanted to attend because of a shared desire to help West Virginia, a trait he found in common with other workshop participants. Kiel has a unique external perspective about the state he now calls home. He was born in Germany and emigrated to the United States fourteen years ago after meeting the woman he would later marry. He was sworn in as a U.S. citizen last year. The WV Chapter of the Association for Talent Development hosts free workshops monthly to discuss topics like leadership, organizational change, training, performance improvement, coaching, and more. Nonmembers are welcome to attend, while paying chapter members are granted access to a variety of additional resources, including an online business directory and discounted registration for the annual state conference. Kiel expressed how the workshop impacted his approach to business and said it would be helpful when working with clients resistant to change. If you are interested in attending an ATD WV workshop or becoming a member, you can learn more at atdwv.org or by emailing atdwvpresident@gmail.com.